"Warm and flavorful, these cheesy quiche-like appetizers are a popular favorite." Preheat oven to 325 degrees F (165 degrees C). Lightly grease four 1 3/4 inch muffin pans. Place reserved liquid from marinated artichoke hearts in a medium saucepan. Over medium heat, slowly cook and stir onion and garlic until tender. In a blender or food processor, mix artichoke hearts, eggs, Cheddar cheese, Swiss cheese, Parmesan cheese, parsley, black pepper, Italian-style seasoning, hot pepper sauce and Worcestershire sauce. Blend until smooth. Stir in the onions, garlic and dry bread crumbs. 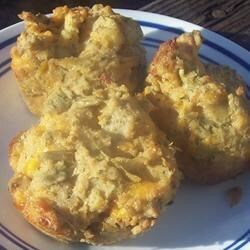 Fill the muffin pans approximately 3/4 inch full with the mixture. Bake in the preheated oven 12 to 15 minutes, until firm and lightly browned. Serve warm. Everyone loved these at Thanksgiving. Making them again, I'd double the artichokes and half the cheese – I thought they were a little greasy and not artichoke-y enough. But they're a great base.